It was a debate to remember last week as Newmarket-Aurora Green Party candidate Vanessa Long made an early exit in the name of “democracy” and leadership. Ms. Long’s premature departure was in protest of a decision by debate hosts the Newmarket Chamber of Commerce, to exclude Progressive Canadian candidate Dorian Baxter from the proceedings citing support at the ballot box the last time around. “Leadership is not about doing what is convenient or uncomfortable, but what is right,” said Ms. Long in her opening remarks which, as it turned out, were also her closing. “Tonight, there is a voice missing in this debate because of a policy passed by the Chamber board, one that ensures no independent or small party candidate will ever be heard at these Provincial or Federal debates again, and that is not right. It is anti-democratic and we either value democracy, or we don’t. We shouldn’t tolerate it, but we do because it is political to do so. It is political to take the easy route and bow to pressure. “Tonight, I wanted to tell you about the Green Party’s plan to eradicate poverty and bring more affordable housing to York Region. I wanted to tell you about our national seniors’ strategy and our plan for youth employment. I believe in a democratic Canada, one that is strong and free, a Canada that protects those who are oppressed and those who need help. I believe it is the job of the powerful to give voice to the powerless, not to grind them down further. With that dramatic opening, Ms. Long apologised to anyone in the audience who came “hoping to hear a democratic debate” and invited the audience and members of the media to follow her to the Newmarket branch of the Royal Canadian Legion for a debate with Mr. Baxter. Few people left to join her. 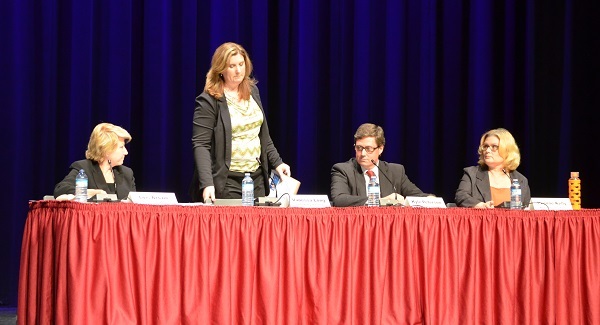 But, the Newmarket Chamber’s debate – and the remaining candidates – soldiered on, including NDP candidate Yvonne Kelly who said she too struggled with the dilemma that faced Ms. Long. She continued on stage with “mixed emotions”, she said. “I too spoke about my feelings in terms of eliminating anyone who wants to speak out at the community level and I weighed [by decision] based on supporting those who have put their support behind me in the past year. I urge the chamber to revisit some of the rules that they have brought in, especially that one, for next year.